Some people really like the big pens. Well, for them, I have a pair of dip pens you may want to see. These are fully-functional, though really novelty pens. The pens are called "The Midget" made by the American Pencil Co. in NY. The holders are 11.25" (28.5cm) long without the nib, 13 7/8" (33cm) long with the nib, 3/4" wide at the thickets part. You can see them with a standard holder and Esterbrook Jackson Stub for scale. The two nibs are interesting. One is the Esterbrook Mammoth, a nib so big it requires a special holder. 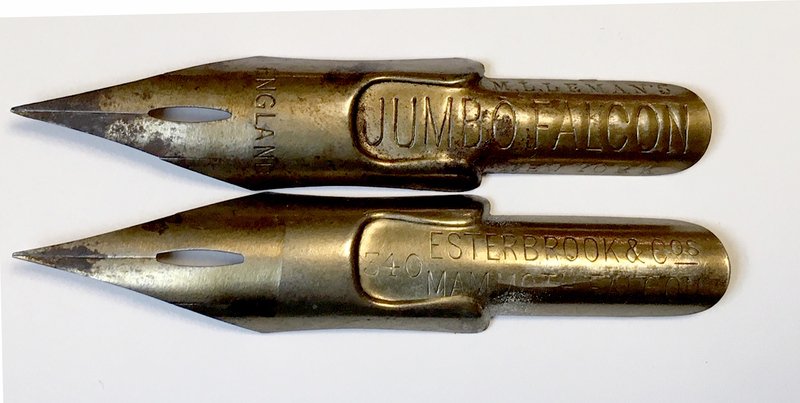 Until I found these, it was the biggest dip pen nib I had seen or heard about. The other one, which is almost identical in size and proportions, was made in England but then imprinted and sold in the US by M. L. Leman of New York and is called a Jumbo Falcon. I've never seen an English pen this large before, and none from anywhere as large as the Mammoth Falcon. But these nibs totally fit the size and proportion of the pens. 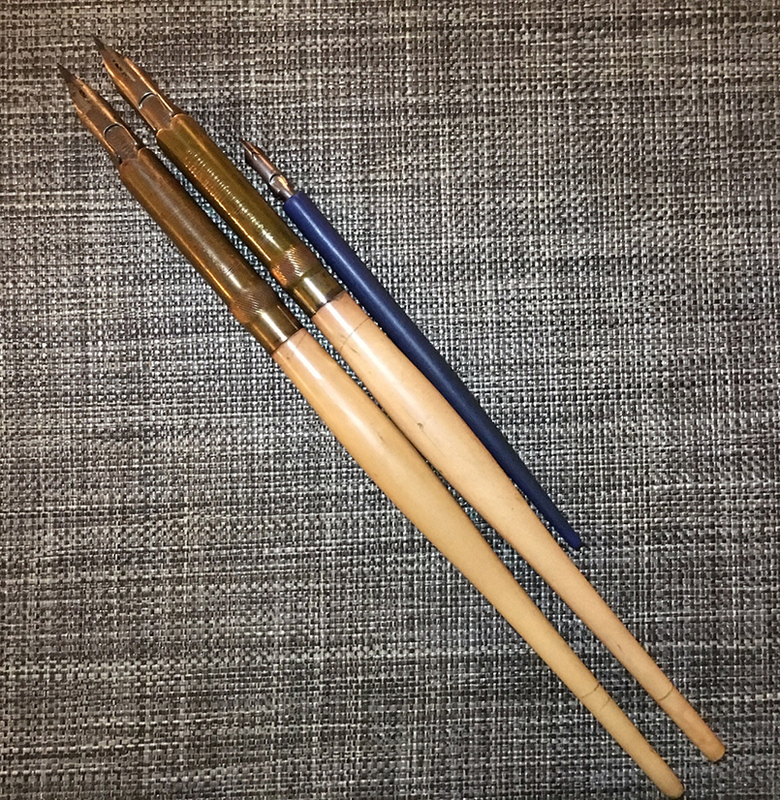 These super-large, novelty dip pens come in a few different styles. I've seen a couple of others, but none quite this large. So, have any ultra-large, novelty pens or pencils you'd like to share? Edited by AAAndrew, 14 December 2018 - 13:31. Wonder where to store these monsters. I shouldn't post before coffee I now see that you mentioned that they are functional so a more appropriate question is, have you used them at all? The Mammoth nib is a bit busted. (tips are slightly bent, like it was used as a spear, a use for which it seems to be suited) I do have another "user" Mammoth nib I may put in it. I've not tried the "Jumbo Falcon" yet. When I've written with a Mammoth nib before, it's difficult to write with because your hand is so far away from the paper. I suspect this will be the same. But other than that, it writes pretty much like any early Esterbrook 048 Falcon. Here's another one I had at the office. I believe it was made by the American News Corporation, which also marketed the "Paragon" steel pens. The holder is marked "A.N.C Columbia" and the nib is also marked "Columbia A.N.C. New York". The nib was once gilt and is significantly larger than the Esterbrook Mammoth Falcon included in the picture, though the holder is just slightly shorter than The Midget in the original post. And, unfortunately, the tips have been broken off the end of this pen as well. Also, unfortunately, the holder is made for just this nib and no other. I suspect this one was meant as a sales display item, not something for use. The whole pen is proportional to a regular pen, which is why the nib is so much larger. The American Pencil ones in the OP seem to be "novelty" pens that could be used with very large, commercial nibs. Definitely crossed on a wall. 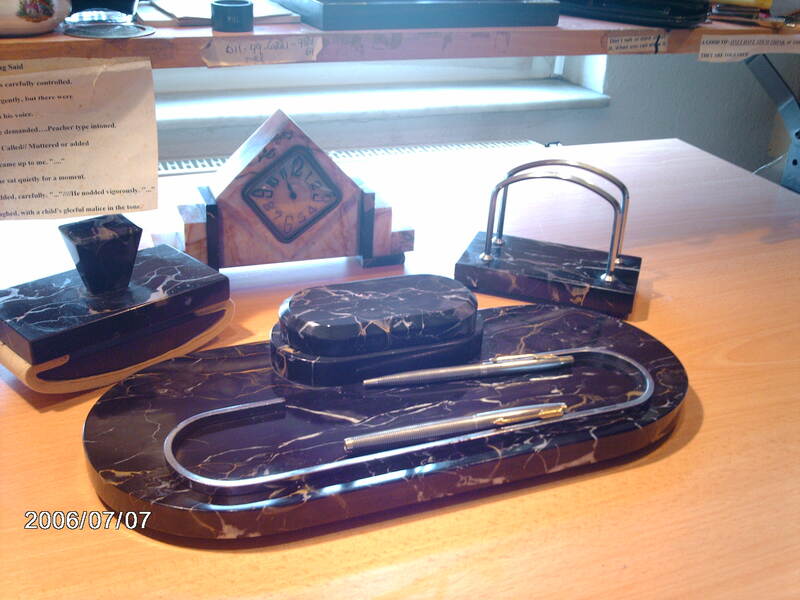 I have a Bauhaus style marble inkwell set with a steel 'pen' holder, that I keep my Eberhard Faber and similar wooden dip pens....going to use them someday. It is 11" long and there is still space for the pen holders with nib. The big holders won't fit at all.